Ryan Whalen » Top coauthors in legal academia. The role that collaboration plays in creativity and the production of knowledge is an major focus of my recent research. As such, I’m generally interested in patterns of collaboration. Having mostly wrapped up the fall submission season and participated in selecting the last articles that I will help select for the Northwestern University Law Review, I found myself wondering about patterns of collaboration in the legal academy. Just judging from the bylines of pieces that crossed my desk during the submission season, the legal academy’s coauthorship rate appears to be much lower than most social sciences, and more comparable to those seen in the humanities. There has been some work done examining these trends (see Ginsburg & Miles 2011; and George & Guthrie 2002), but nothing approaching a large-scale examination, nor any thorough statistical modeling of the relationship between coauthorship and article impact. So, I dug around for some data and have started putting together some analyses. In the meantime I also stumbled upon this nice piece by Edelman and George (2007) that attempts to identify legal academia’s equivalent of Paul Erdos (they choose Cass Sunstein as the most Erdos-like). During their selection process, Edelman & George were somewhat constrained by the data at hand and were unable to calculate “the number of coauthors for the roughly 7000 law professors.” Luckily, I have access to some data that can help us assess whether Sunstein’s appointment as Legal-Erdos is the most appropriate. The Thomson Reuters Web of Science indexes many legal journals, including about 100 student-edited Law Reviews. The indexing begins in 1956, and between then and now contains data on around 100,000 law review articles. I pulled metadata on all of these articles and used them to create a legal academic coauthorship network. The initial 100,000 papers listed 52,945 unique author names. I selected all the multi-authored pieces and constructed a network with links between any individuals listed as coauthors on these pieces. The result is a network with 11,474 authors, linked together quite sparsely with 12,546 coauthorship relations. So, who is the legal academy’s Paul Erdos? Well, if we were to choose purely based on the number of coauthoring relations, it would appear to be Martha Minow. Alternately, if we sort by Eigenvector centrality we’d opt for William Brennan. Sunstein is comfortably in the 99.9th percentile of collaborators, so opting for him can certainly be supported. In reality there’s no clear answer because the research and publishing norms in the legal academy are so different from those in mathematics. 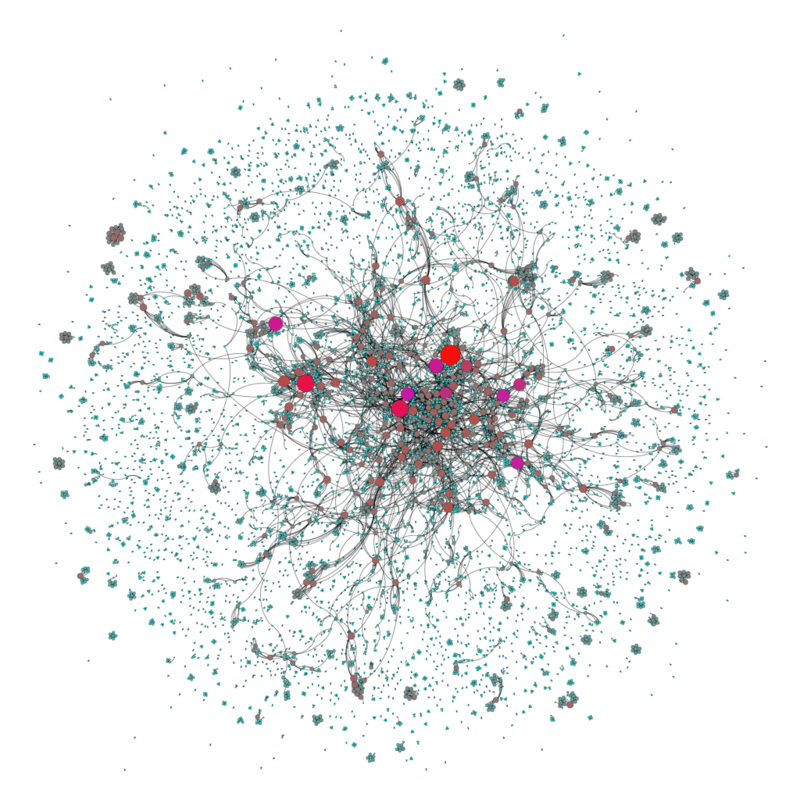 Because the network has no large connected component and over 3,000 isolated sub-networks, regardless of who you choose as the Legal-Erdos almost every legal academic would have an Erdos number of infinity. Nonetheless, the data is interesting to look at, so I did some slicing and dicing. The table below lists the top 30 collaborators and their number of coauthors. These top 30 are the coauthoring superstars. The vast majority of authors didn’t coauthor at all (they’re excluded from the network) and those who did coauthor tended to only do so with one or two other authors. The diagram below shows this distribution. The x-axis here starts at 1 (because I excluded those with 0 coauthoring relationships) so you can see that over 6000 of our 11,474 authors only coauthored with one other author. The number of academic partnerships drops off quickly before reaching the maximum of 38. Caveats: The Web of Science does not index all law reviews (although it does index most of the top-ranked legal journals). Also, in constructing this network I relied on the author last name and initials provided by Thomson Reuters. Most authors included two initials. This method of matching risks over/under counting actual coauthorship (i.e. ‘Dorsen, N’ could refer to papers written by another ‘Dorsen N’ thus overcounting, and ‘Redish M’ would not have been linked to ‘Redish MH’, thus undercounting). The risk of undercounting is likely substantially higher than the risk of overcounting. 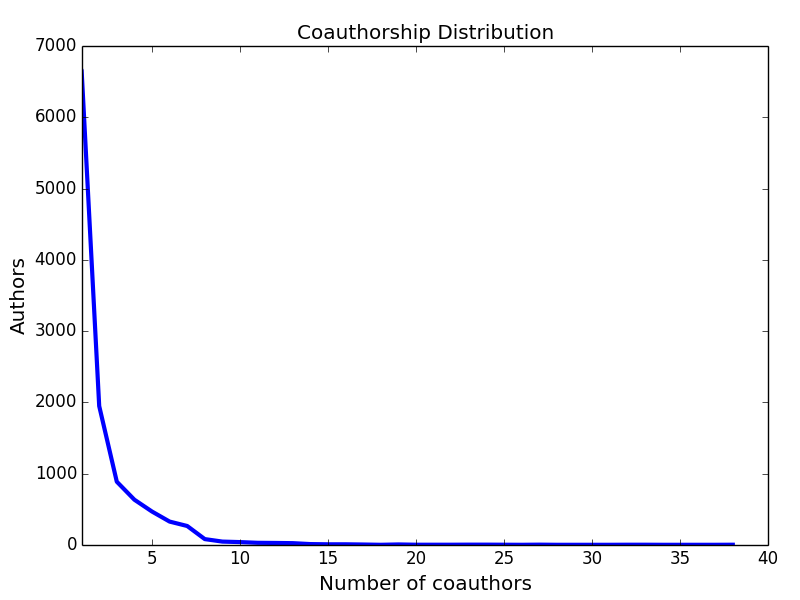 In addition, I excluded papers with more than 10 coauthors when constructing the coauthorship network. There were a few review pieces with over 50 authors that were skewing the data. Note that this is a blog post that was principally undertaken to provide a productive-seeming way to procrastinate and put off dissertation work. Neither the data nor the methods used here are perfect, in fact both are admittedly imperfect. If you experience more than 4 hours of author-node-clicking call a physician immediately. Don’t hesitate to get in touch if you have any questions.